Photo by and with permission from Bubboboo (eBay). My Video Genie was exactly same as the one in the picture above. 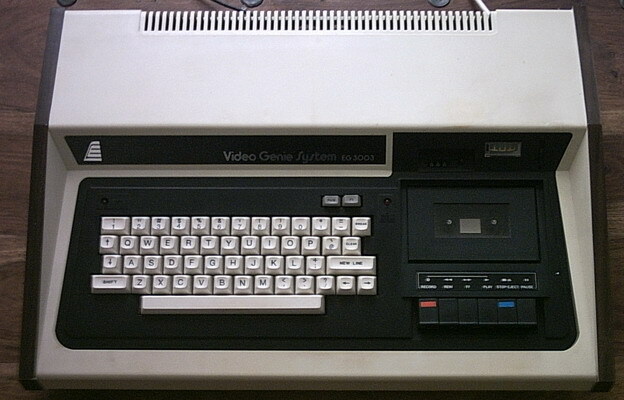 This is the second model with all 4 arrows, clear key, lacking shift on right side and having a volume control and VU-meter with the cassette player. The first model had no right arrow (tab) or clear key and no volume control or VU-meter. Made by EACA International LTD. Marketed in England as a product of Lowe Electronics, and in Germany as a product of Trommeschläger Computer gmbh etc. EACA wasn't mentioned. System 80 (Australia, NZ), PMC-80 (USA) and HT-1080Z (Hungary) are certainly the same. TRZ-80 (South Africa) according a review in 80 Micro January 1982 by Eric Lindsay. Video Genie was the western European name. It's physically quite different but most of the hardware is similar. 4: ROM/BIOS startup message "READY?" "MEMORY SIZE?" 5: ROM/BIOS second message 23 CR's (clear screen and start at bottom) "RADIO SHACK LEVEL II BASIC"
The significant changes are 1 and 2, programs usually use the ROM routines for these devices so they work still. The ROM routine for the printer doesn't have a timeout, so if a program has its own routine with a timeout there could be a problem. Patching such a program is pretty easy though. The 32 character mode is also different in what it does. The Video Genie exands either the left half of the screen, or the right half if the 'Page' button is down. The TRS-80 expands every other character and has no 'Page' button. David Keil's emulator for MS-DOS is no longer available from his site, and it is a long time since it was maintained. It doesn't work well with later versions of windows and some functionality is lost under windows based on WinNT. Using it with an MS-DOS based windows like Win98se it is still a great tool. And I can usually get it to work under WinXP with some functionality loss: Real disk is not possible. Graphics driver has problems, and you need to restart it after changing disks or changing options. Use a pc as a cassette deck. TRS-80 Model I Expansion Interface Schematics Layout (146k 100DPI JPG), page 1 (157k 300DPI PNG) and page 2 (125k 300DPI PNG).